Lacaille, Nicolas-Louis de (1713-62) French astronomer, known as the 'father of southern astronomy'. He led an expedition to the Cape of Good Hope (1750-54) where he formed 14 new southern constellations which he named after items of scientific equipment. The major achievement of this expedition was the cataloguing of over 10,000 stars, published posthumously as Coelum australe stelliferum (1763). Using only small refractors, Lacaille also discovered 42 previously unknown nebulae, which he correctly deduced were objects within the Milky Way. He also postulated that the Magellanic Clouds are detached parts of our Galaxy. With Jerome lalande, he measured the lunar parallax. Lagoon Nebula (M8, NGC 6523) Bright emission nebula surrounding the young open star cluster NGC 6530 in the constellation Sagittarius (RA 18h 03m.3 dec. — 24°23'). The eastern half of the nebula is illuminated by hot O-class stars in NGC 6530, while the western half is illuminated by 9 Sagittarii. 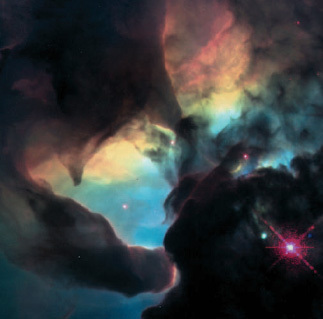 The Lagoon Nebula is divided by a broad lane of obscuring dark dust. First recorded by John flamsteed in 1680, the Lagoon has angular dimensions of 45'X 30' and mag. +6.0. It lies 5200 l.y. away in the direction of the galactic centre, and covers an area of 60 X 38 l.y. the equilibrium points. The points L1, L2 and L3 are unstable, and any objects in these orbits would very slowly drift away (although some particular orbits in these vicinities are stable). The trojan asteroids are close to the L4 and L5 points of Jupiter's orbit around the Sun, with oscillation amplitudes around the equilibrium points of up to 30°. Similar orbits occur in Saturn's satellite system. The tiny satellites Telesto and Calypso are close to the L4 and L5 points of Tethys' orbit around Saturn, and Helene is close to the L4 point of Dione's orbit. The spacecraft soho has been placed into a stable orbit close to the L1 point of the Earth. This point is located between the Earth and the Sun at about 1,500,000 km (930,000 mi) from the Earth, which is about four times the distance of the Moon and one hundredth of the distance to the Sun. Lagoon nebula A highresolution Hubble Space Telescope image of the Lagoon Nebula’s centre, showing ‘twister’ structures. Globules, precursors of star formation, are also found in abundance here. Lalande, (Joseph) Jerome Le Francois (1732-1807) French astronomer, skilled mathematician and observer and popularizer of astronomy, who became director of paris observatory (1768). He compiled many accurate tables of planetary positions and a catalogue of over 47,000 stars. Lalande organized expeditions to observe the transits of Venus in 1761 and 1769, preparing detailed reports. He collaborated with Nicolas-Louis de lacaille in determining a highly improved value for the lunar parallax, Lalande observing from Berlin, Lacaille from South Africa. Lambda Bootis star Population I galactic disk star that is severely depleted in certain metals. The prevailing theory is that when young, these stars accreted interstellar gas that was depleted in refractory (high-condensation temperature) metals. A Lagoon nebula A high-resolution Hubble Space Telescope image of the Lagoon Nebula's centre, showing 'twister' structures. Globules, precursors of star formation, are also found in abundance here. LACERTA (gen. lacertae, abbr. lac) Small, inconspicuous northern constellation, representing a lizard, between Cygnus and Andromeda. Lacerta was introduced by Hevelius in 1687. Its brightest star, a Lac, is mag. 3.8. Deep-sky objects include NGC 7243, an open cluster of several dozen stars of mag. 8.5 or fainter; and BL Lac, the variable nucleus (range 12.4-17.2) of a remote elliptical galaxy and the first object of its type (see BL LACERTAE OBJECT) to be recognized. Lagrange, Joseph Louis (1736-1813) French mathematician, regarded as the 18th century's greatest, born in Turin, Italy, where he did his early work. After serving as director of the Berlin Academy (1767-87), he emigrated to Paris, where he spent the rest of his life. His contributions to astronomy were in celestial mechanics, including the Moon's libration, the gravitational interactions of Jupiter and its Galilean satellites, and the three-body problem - for which he found special solutions that suggested the existence of five equilibrium positions, now known as the LAGRANGIAN POINTS. Lagrangian point In a system where a body orbits a more massive primary, there are five key positions where the gravity of the two balances out such that a third body can remain there stably. 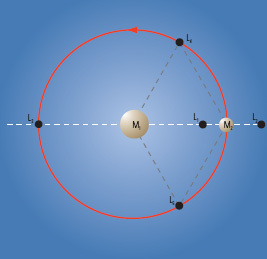 The L1 position, close to the less massive body on the line towards the primary, is one such Lagrangian point; many spacecraft are stationed around the L1 point between Earth and the Sun. The L4 and L5 (60? ahead of and behind the planet) Lagrangian points of Jupiter’s orbit are occupied by Trojan asteroids. Langley Research Center national aeronautics and space administration (NASA) facility at Hampton, Virginia, for research in advanced aerospace technologies such as airframe systems. More than half of Langley's research is in aeronautics, with applications not only to military and civilian aircraft but also to spacecraft. Studies of the behaviour of materials in non-terrestrial atmospheres will ensure that next-generation spacecraft will be able to survive extreme environments. Langley Research Center This model of the Space Shuttle is undergoing wind tunnel tests at NASA’s Langley Research Center to simulate the stress of re-entry. Langrenus Lunar crater (9°S 61°E), 132 km (82 mi) in diameter, with rim components rising 2750 m (9000 ft) above its floor. A nearly circular crater, it is near the limb of the Moon, appearing oblong as a result of foreshortening. Langrenus has bright ray ejecta, which is fragmental because of its age. The floor contains several central peaks, due to rebound after impact. The side walls are heavily terraced. Langrenus, Michael Florentius (or Michiel Florenz van Langren) (1600-1675) Flemish engineer and cartographer who, in 1645, compiled the first published map of the Moon. Langrenus began mapping the Moon as part of a project to find longitude at sea by noting the precise times at which specific lunar mountains were illuminated or darkened by the Sun as observed from different locations. He introduced the practice of naming lunar features after famous persons. Laplace, Pierre-Simon de (1749-1827) French mathematician who did much to establish celestial mechanics as a major scientific discipline; his Mechanique celeste is, after Isaac Newton's principia, the most important work on the subject. His instructors at Caen University, where he matriculated at the age of sixteen, soon recognized his talents for complex mathematical methods, and three years later Laplace secured a position as professor of mathematics at the Ecole Militaire. By 1771 he had published a fundamental study on the orbits and perturbations of the planets that was the cornerstone of his later studies of Solar System dynamics. This work was followed by a three-part study (1784-86) of the orbital mechanics of Jupiter and Saturn that utilized methods first developed by Joseph Louis de lagrange to demonstrate that not only those two giant planets, but all the Solar System's bodies, will tend to assume orbits of small eccentricity and small inclination over long time periods. This was the first major post-Newtonian work to show that the Solar System is stable under the precepts of Newtonian gravity. Many of these ideas were more fully explicated in his five-volume mas-terwork Traite de mechanique celeste (1799-1825). In Exposition du systeme du monde (1796) Laplace proposed his nebular hypothesis. His studies of comets led him to issue a warning that comets could collide with the Earth, which would have catastrophic consequences for life on our planet. Large-Area Multi-Object Survey Telescope (LAM-OST) Chinese optical telescope of unusual design, located at the Xinglong station of the beijing astronomical observatory and expected to become operational in 2004. A 5.7 X 4.4-m (220 X 170-in.) reflective Schmidt corrector feeds light to a fixed spherical mirror 6.7 X 6.0 m (265 X 236 in.) in size. Both components use segmented-mirror technology, and the corrector moves to allow the telescope to track objects across the sky. Fibre-optic tubes transmit light from some 4000 objects in LAMOST's 5° field of view to stationary spectrographs. Large Binocular Telescope (LBT) Unique facility for optical astronomy at mount graham international observatory consisting of two 8.4-m (331-in.) telescopes mounted in parallel on the same structure with an axial separation of 14.4 m (47 ft). Due for completion in 2004, it will have the light-gathering power of a single 11.8-m (465-in.) telescope. The binocular configuration makes interferometric imaging easier than with separately mounted telescope arrays like the very large telescope. The LBT project is a partnership between the University of Arizona, the arcetri astrophysical observatory, a consortium of German institutions and other US universities. Large Magellanic Cloud (LMC, Nubecula Major) Small galaxy that is the nearest external galaxy to our own. It is about 170,000 l.y. away and has just 5% to 10% of the mass of our Galaxy. It extends over about 8° of the sky within the constellations of Dorado and Mensa (RA 05h 30m dec. —68°), where it is easily visible to the naked eye, appearing like a detached portion of the milky way. The Large Magellanic Cloud (LMC), along with the small magellanic cloud, is named after Ferdinand Magellan, who observed them during his voyage around the world in 1519, but they were known before that date. The LMC's physical diameter is 25,000 to 30,000 l.y. At first sight it appears to be an irregular galaxy, but it has a central bar and possibly a spiral arm, so it is generally classed with the spiral galaxies. The TARANTULA NEBULA complex is found within the LMC and is one of the largest HII REGIONS known. The complex is a vigorous star-forming region, and this, together with other star-forming regions, may be the result of a close passage between the LMC and our Galaxy some 200 million years ago. There is also an enormous bridge of material between the Galaxy and the MAGELLANIC CLOUDS. Known as the Magellanic Stream, this bridge is one of the largest HIGH-VELOCITY CLOUDS known and probably resulted from the same close passage. The LMC orbits our Galaxy roughly at right angles to the plane of the Milky Way, and it may at some time in the future be disrupted and captured by our Galaxy. Young objects, such as hot stars and Cepheids, in the LMC lie in a thin disk, which is seen nearly face-on (an angle to the plane of the sky of about 27°). Older objects, such as planetary nebulae, form a somewhat thicker disk structure, but there is no evidence at present for a spherical halo such as is formed by very old objects in our own Galaxy. In our Galaxy, GLOBULAR CLUSTERS are all old objects. However, the cluster NGC1866 in the LMC, though globular in form, is a young system. Several such 'blue globulars' exist in the clouds. No similar objects are known in our own Galaxy. large-scale structure Overall distribution of galaxy clusters and galaxies in the visible Universe. This distribution has been mapped in two wedges by astronomers up to a redshift of z = 0.04. A relevant cosmological model must explain the large-scale structure of matter in the Universe, essentially the distribution of galaxies and galaxy clusters. This is usually done by comparing the CORRELATION FUNCTIONS derived from theoretical models utilizing COLD DARK MATTER or HOT DARK MATTER with the correlation function of the observed large-scale distribution of galaxies. There are several features of note in the observed distribution: VOIDS or regions generally devoid of galaxies; walls or linear distributions of galaxies and clusters; and SUPERCLUSTERS such as the Coma Cluster of galaxies. Larissa Second-largest (after PROTEUS) of the inner satellites of NEPTUNE. Larissa was first detected in 1981 by Harold Reitsema and colleagues when it occulted a star; it was confirmed in 1989 in images returned by VOYAGER 2. Larissa is near-spherical in shape, measuring about 208 X 178 km (129 X 111 mi). It takes 0.555 days to circuit the planet, at a distance of 73,500 km (45,700 mi) from its centre, in a near-circular, near-equatorial orbit. Las Campanas Observatory Major optical observatory in the southern Atacama Desert 100 km (60 mi) north of La Serena, Chile, at an altitude of 2400 m (7900 ft). It was established by the CARNEGIE OBSERVATORIES in 1969, and remains their primary observing site. The main instruments are the two 6.5-m (256-in) MAGELLAN TELESCOPES. The 2.5-m (98-in.) Irenee du Pont Telescope and the 1-m (39-in) Henrietta Swope Telescope, completed in 1977 and 1972 respectively, both have unusually wide fields of view. laser (acronym for 'light amplification by stimulated emission of radiation') Device that produces a beam of high-intensity, coherent (all waves in phase), monochromatic (all of one wavelength) ELECTROMAGNETIC RADIATION at infrared, optical or shorter wavelengths. A similar device at microwave frequencies is known as the MASER. The stimulated emission of a photon of particular wavelength occurs when an electron in a high-energy level of an atom is induced to drop to a lower level by an encounter with a photon of energy exactly equal to the difference in energy between the upper and lower levels. The emitted photon has exactly the same wavelength and direction of propagation as the stimulating photon, and the emitted radiation is said to be coherent. In a laser, large numbers of electrons are pumped up into a higher energy level by means of a suitable energy source so that there are more electrons in the higher level than the lower level; this distribution of electrons is known as an 'inverted population'. The electrons are then stimulated to emit a beam of coherent radiation. 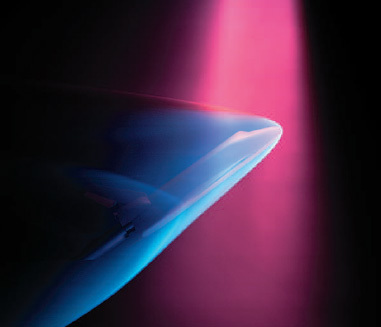 Laser action can be produced in solids, liquids or gases, and lasers may be pulsed or continuous in operation. Lasers are used in various astronomical contexts. For example, very precise measurements of the lunar distance, and the Moon's slow rate of recession, have been made by bouncing laser beams off reflectors placed on the lunar surface by the Apollo astronauts, and laser beams reflected from orbiting satellites allow the rate of continental drift to be measured. Lasers are also used to check and maintain the alignment of optical components, particularly in very large telescopes with segmented primary mirrors. Laser Interferometer Gravitational-wave Observatory (LIGO) Giant laser interferometer at Livingston, Louisiana, about 80 km (50 mi) north-west of New Orleans, consisting of mirrors suspended at the corners of an L-shaped vacuum vessel 4 km (2.5 mi) on a side. It is designed to sense the minute motions of the mirrors that would be caused by GRAVITATIONAL WAVES from supernova collapses and collisions of neutron stars, and the gravitational remnants of the Big Bang. LIGO is a joint project of the CALIFORNIA INSTITUTE OF TECHNOLOGY and the Massachusetts Institute of Technology, and is sponsored by the National Science Foundation. La Silla Observatory First of the two observing sites of the EUROPEAN SOUTHERN OBSERVATORY, inaugurated in 1969. It is near the southern extremity of the Atacama Desert, 160 km (100 mi) north of La Serena, Chile, at an altitude of 2400 m (7900 ft). ESO's smaller telescopes were the first on the site: the 1-m (39-in.) and the 1.5-m (59-in.) were both installed in the late 1960s. The 1.0-m (39-in.) Schmidt telescope began work in 1971 and was joined in 1976 by the 3.6-m (142-in. ), the largest instrument at La Silla. The 1.4-m (55-in.) Coude Auxiliary Telescope (CAT) was built to provide an alternative feed to the 3.6-metre's high-resolution spectro-graph, while in 1984 the 2.2-m (87-in.) began operation. (The CAT and the Schmidt have since been decommissioned.) The NEW TECHNOLOGY TELESCOPE and SWEDISH ESO SUBMILLIMETRE TELESCOPE followed in the late 1980s. In addition to the ESO telescopes, La Silla hosts a number of national telescopes operated by ESO member states, the largest being the Geneva Observatory's 1.2-m (48-in.) telescope. Lassell, William (1799-1880) English 'Grand Amateur' astronomer. By the age of 25, he had founded the brewery that would finance his lifelong career in T Larissa During its 1989 astronomical research. Lassell studied primarily the August flyby, Voyager 2 bodies of the outer Solar System. Following the imaged Neptune's inner announcement of the Berlin discovery of Neptune on satellite Larissa. 1846 September 30, he quickly located the new planet and on October 10 identified its large satellite, Triton; five years later he found Uranus' satellites Ariel and Umbriel (1851). He also co-discovered (with G.P. and W.C. BOND at Harvard) Saturn's Crepe (C) Ring and its satellite Hyperion (1848). Lassell's enduring reputation comes from his transformation of the big reflecting telescope from the timber and rope altazimuth constructions developed by William Her-schel to beautifully engineered iron equatorials with superlative optics. His 9-inch (230-mm) and 24-inch (0.6-m) Newtonians were the first sizeable instruments of their type to be mounted equatorially. With his engineer-astronomer friend James Nasmyth (1808-90), Lassell pioneered the prototype steam-powered polishing machine for making 48-inch (1.2-m) mirrors, and constructed a 48-inch Newtonian on a fork mounting. Then, having developed the most technically exact and versatile reflecting telescopes of the age (and published the details of their construction), he spent over five years in Malta, using them in a 'prime sky' location. late heavy bombardment Period of intense cratering in the inner Solar System near the end of the formation of the terrestrial planets. Evidence for the bombardment is seen in the distribution of craters on Mercury, Mars and the Moon. Ages of lunar rocks indicate that the large mare basins were formed between about 4.0 and 3.8 billion years ago. Undoubtedly, the early Earth experienced impacts of comparable or larger magnitude, but much of the evidence has been erased by erosion and tectonics. It is not clear whether the bombardment was simply the final stage of a continuously declining flux of impacts at the end of accretion of the planets, or whether it was a distinct 'cataclysm' with a temporary large increase in the impact rate. If the latter, the projectiles may have been asteroids perturbed from the main belt by Jupiter, or comets scattered from the outer Solar System due to the formation of Uranus and Neptune. late-type star Lower temperature star of spectral class K, M, R, N or S. The term was devised when astronomers erroneously believed that the sequence of spectral types was also an evolutionary sequence. The usage persists, 'late' being a common astronomical synonym for 'cool' (for example, a G5 star is 'later' than a G0 star). latitude Angular measure from an equatorial great circle or plane in a spherical coordinate system. On the surface of the Earth, latitude is measured in degrees north or south of the equator, reaching a maximum at the poles. Celestial latitude (or ecliptic latitude) is the angular distance north or south of the ecliptic to the ecliptic poles. Galactic latitude is a measure of angular distance from the galactic equator to the galactic poles. Heliocentric latitude is the same as celestial latitude, but corrected for a hypothetical observer located at the centre of the Sun, while heliographic latitude is measured on the Sun's disk, north or south of its equator. launch window Period of time during which it is possible to launch a particular space mission. leap second Periodic adjustment by one second of coordinated universal time (UTC) to ensure that it remains linked to the rotation of the Earth. The braking action of the tides causes the Earth's period of rotation to slow by between 1.5 and 2.0 milliseconds per day per century. In order that time as kept by atomic clocks (UTC) and that derived from observations of the stars (UT1, see universal time) do not differ by more than 0.9 seconds, an extra second is introduced to UTC at midnight on either December 31 or June 30 as required. Date TAI-UTC 1989 December 31 +25.0 sec; 1990 December 31 +26.0 sec; 1992 June 30 + 27.0 sec; 1993 June 30 + 28.0 sec; 1994 June 30 + 29.0 sec; 1995 December 31 + 30.0 sec; 1997 June 30 + 31.0 sec; 1998 December 31 + 32.0 sec. leap year Year containing 366 instead of the usual 365 days. The calendar is based on a solar year of 365.25 days but fixed at 365. An extra day is therefore added at the end of February every fourth year to compensate. However, this still only approximates to the true solar year of 365.24219 days and so century years (1800, 1900, and so on) are not leap years unless exactly divisible by 400 (1600, 2000, and so on). Leavitt, Henrietta Swan (1868-1921) American astronomer who discovered 2400 variable stars, and whose studies of Cepheid variables in the Small Magellanic Cloud led to the discovery of the period-luminosity relationship used to measure cosmic distances. Edward C. pickering hired Leavitt, who was deaf, to work at Harvard College Observatory, originally as an unpaid volunteer, on the tedious task of measuring the brightness of star images on Harvard's massive collection of photographic plates. In 1902 Leavitt's work was recognized when she was appointed head of Harvard's Department of Photographic Photometry. She began to specialize in variable stars (in all she would discover 2400 - half the total known in her lifetime), studying images of cepheid variables on plates taken at Harvard's southern station at Arequipa, Peru. While analysing images of stars in the Magellanic Clouds, Leavitt noticed that the periods of stars that appeared to be Cepheids depended on their apparent magnitudes - the more luminous they were, the longer their periods. In her 1912 paper summarizing this work, she gave the periods for 25 Cepheids in the Small Magellanic Cloud. By 1918 Ejnar hertzsprung and Harlow shapley had recast the period-luminosity law in terms of absolute, rather than apparent, magnitudes, which allowed Leavitt's Cepheid variables to be used as reliable yardsticks for measuring distances within the Milky Way galaxy and, once they had been discovered in the Andromeda Galaxy, beyond. Leavitt's other studies included preparatory work on the north polar sequence, a standard reference for photographic magnitudes she helped to establish by comparing nearly three hundred plates of the region around the north celestial pole taken through different telescopes. LemaTtre, Georges Edouard (1894-1966) Belgian Catholic priest and cosmologist whose theory of the 'primeval atom' foreshadowed the Big Bang theory. He began his work on the expansion of the Universe during a postdoctoral fellowship at Harvard (1924-25). Lemaitre heard that Edwin hubble had used cepheid variables in the Andromeda Galaxy to determine that it lay far beyond the Milky Way, and was aware of Vesto M. slipher's earlier finding that the radial velocities of galaxies showed a redshift in their spectra. He realized that galaxies must be speeding away from one another. Independent of similar ideas proposed by Aleksandr fried-mann (which were not well known outside Russia), he considered how this expansion would vary with time according to general relativity, taking into account the effect of the pressure of matter, and assuming a nonzero value of the cosmological constant. This lemaitre universe, as it became known, was the first to attempt to reconcile a cosmological model with the observed expansion of the Universe. Lemaitre became professor of astronomy at Louvain in 1927. That year he published a paper stating that the more distant a receding galaxy, the greater its velocity of recession - a concept not explained by Friedmann. Arthur edding-ton publicized Lemaitre's results at the 1927 meeting of the Royal Astronomical Society. In 1931 Lemaitre proposed that the Universe was born from a 'primeval atom' that disintegrated over time to produce gaseous clouds, stars and cosmic rays, an idea we now know to be incorrect. The Belgian priest is often considered the father of the big bang theory (which Lemaitre himself colourfully called the 'fireworks theory') of cosmology. LemaTtre universe Same as the friedmann universe, except that Lemaitre assumed the value for the cosmological constant was non-zero. Le Monnier, Pierre Charles (1715-99) French astronomer and physicist whose scientific career spanned many different disciplines. In celestial mechanics, he analysed the perturbing effect of Saturn on Jupiter's orbit and devised a theory to explain the Moon's complex motions. His contributions to celestial cartography included the measurement of many star positions and compilation of the Atlas celeste. Le Monnier observed Uranus before it was seen by its discoverer, William Herschel, but failed to recognize it as a planet. lens Basic optical component made of transparent material through which light passes in order to produce or modify an image. Astronomical lenses range in size and complexity from tiny spherical sapphire lenses attached to the ends of fibre optics, through to large objective lenses used to collect and focus light in refracting telescopes. Lenses are also used to shape and direct light as it passes through astronomical instruments for analysis and measurement, but the most common example as far as the amateur astronomer is concerned is the telescope eyepiece. There are two basic types of lens, converging and diverging. Converging lenses are thicker in the centre than at the edges and cause parallel light passing through them to bend towards a common point, that is, to converge. The simplest example of a converging lens is the magnifying lens. Diverging lenses cause parallel light to spread out and to appear to come from a common point behind the lens, that is, to diverge. Diverging lenses are thicker at the edges than at the centre and the most common example is the spectacle lens used to correct short-sightedness. Converging lenses often have two convex surfaces and so are sometimes called convex lenses. Diverging lenses often have two concave surfaces and so are called concave lenses. However, both types can have one convex surface and one concave so this terminology can be slightly misleading. A lens can produce a focused image because light is bent (refracted) as it passes from air to glass and then from glass back to air. It is the shape of the air-glass surface that determines how the light is bent and what effect this has on the image produced. Surfaces are usually spherical, although more complex shapes are used to reduce optical aberrations. Several manufacturers now advertise binoculars with aspheric optics which offer superior performance. lenticular galaxy galaxy that appears lens-shaped when seen edge-on. Lenticular galaxies are of a type intermediate in form between the much more common elliptical and spiral types. They are classified S0, which indicates that they have the flattened form of spirals but no spiral arms. Lenticular galaxies contain both central bulges and surrounding disks of stars, and the disks include significant amounts of dust in some cases. Leonids Interesting meteor shower, active between November 15-20 and usually peaking around November 17. The radiant lies within the 'sickle' of Leo. The shower produces reasonable activity each year, with peak zenithal hourly rate (ZHR) about 15. It attracts most attention, however, in the ten-year span centred on the perihelion return of the parent comet, 55P/tempel-tuttle, during which time rates are greatly elevated, perhaps reaching meteor storm proportions on some occasions. Past Leonid storms have been separated by roughly 33-year intervals: those on 1799 November 12 and 1833 November 12 did much to stimulate scientific interest in the study of meteors. The later time of maximum at the modern epoch results from regression of the meteor stream orbit's descending node. Following the 1833 return, Hubert Newton (1830-96) of Princeton, United States, investigated the origin of the Leonids. He found historical records of the shower going back to ad 902, including exceptional displays in 934, 1002, 1101, 1202, 1366, 1533, 1602 and 1698. Newton surmised that these were caused by a dense cloud of meteoroids encountered by Earth at intervals of about 33 years; he made the bold prediction, confirmed by Heinrich olbers, that another storm might occur in 1866. This prediction was duly borne out on 1866 November 13-14, when Leonid rates are estimated to have reached 10,000/hr over western Europe. LEO MINOR (gen. leo minoris, abbr. 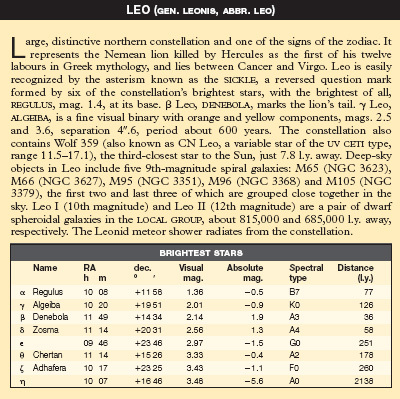 lmi) Small, inconspicuous northern constellation, representing a small lion (compared to Leo), between Ursa Major and Leo. Leo Minor was introduced by Hevelius in 1687. 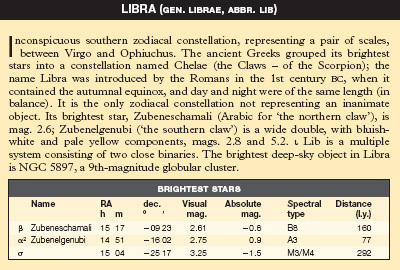 Its brightest star, 46 LMi (there is no a Leo Minoris), is mag. 3.8. p LMi is a very close binary with yellow components, mags. 4.4 and 6.1, separation 0".2. Deep-sky objects include NGC 3245, an 11th-magnitude lenticular galaxy. Subsequent gravitational perturbations by Jupiter and Uranus pulled the densest parts of the Leonid stream away from close encounter with Earth, and the much-anticipated 1899 return proved a relative disappointment: while rates were again enhanced (200-300/hr), the shower did not produce a storm. Comparatively modest returns also followed in 1932 and 1933. The strongest historical displays had usually been seen when the comet/stream orbit's node lay inside Earth's orbit, and Earth arrived there within 2500 days of the comet. Further gravitational perturbations restored such conditions in time for the 1966 return, when estimated Leonid rates of 140,000/hr were seen in a 40-minute interval by observers in the western United States on the morning of November 17. The Leonids were again the subject of much study around the 1998 perihelion of 55P/Tempel-Tuttle. Activity began to increase markedly in 1994, and many attempts were made to forecast when any storm might occur at this return. No storm was seen in 1998, when Earth followed the comet to the node by 258 days. Instead, to the great surprise of all, an outburst comprising mainly bright Leonids occurred some 16 hours ahead of node-passage, with ZHR around 250 for some 10-12 hours. The 1999 shower, however, did produce storm activity, albeit at lower levels than many of the great events of the past: around node-passage on November 18d 02h UT, ZHR reached about 3000, with activity on this occasion consisting mostly of faint Leonids. Observatory and D.J. Asher of Armagh Observatory, Northern Ireland. They based their stream model on discrete filaments or arcs of debris that remained close to the nucleus following their release at separate perihelion returns of 55P/Tempel-Tuttle. Using this model McNaught and Asher have been able to predict, with reasonable accuracy, the times of several peaks during the 1999 and 2000 displays. More importantly, they were successful in forecasting substantial peaks around 10h and 19h UT on 2001 November 18, each of which produced activity similar to that in 1999. The strong activity in 2001 persisted for several hours centred on these maxima, unlike the short-lived, sharp peak two years earlier. In the longer term, forecasts for the Leonids' next round of elevated returns around 2032 are not particularly favourable, as their orbit is once again pulled away from Earth. Expectations are that the most active displays at that time may be about double those seen in most years from the PERSEIDS. Leonov, Alexei Arkhipovich (1934- ) Soviet cosmonaut, born in Siberia, who was the first man to 'walk' in space, during the second orbit of the Voskhod 2 spacecraft on 1965 March 18. This first 'extra-vehicular activity' lasted just ten minutes. He went on to train for the abortive Soviet manned lunar programme. In 1975 Leonov commanded the Soyuz spacecraft that successfully docked with a US Apollo vehicle in the Apollo-Soyuz Test Project. leptons Spin fermions that do not interact through the strong force. Some examples of leptons are electrons, positrons and neutrinos. Each of these particles carries a quantum number called the lepton number of +1, while their antiparticles have a lepton number of — 1. They are restricted to weak interactions and, if electrically charged, to electromagnetic interactions. The neutrinos take part in weak interactions only. Leptons do not join together to form other particles, and do not appear to be made up of quarks. Le Verrier, Urbain Jean Joseph (1811-77) French mathematician who specialized in celestial mechanics, predicting the existence of Neptune from the perturbations of Uranus. Trained as an experimental chemist, he shifted his research interests to astronomy after accepting a post at the Ecole Polytechnique in 1837. As director of Paris Observatory (1854) he introduced major reforms; he was dismissed from office in 1870 but reinstated after the death of his successor, Charles DELAUNAY, in 1872. Le Verrier analysed the stability of orbits of planets and minor bodies of the Solar System, including periodic comets. He investigated the advance in the perihelion of Mercury, which he attributed to a hypothetical planet prematurely named VULCAN. But it was his careful analysis -independently of John Couch ADAMS - of discrepancies between predicted and observed positions of Uranus that brought Le Verrier his greatest fame. He was able to compute the position of a hitherto undiscovered planet orbiting beyond Uranus that explained the irregularities in terms of gravitational perturbations by the new body. Using Le Verrier's calculations, Berlin Observatory astronomers Johann GALLE and Heinrich D'ARREST located the new planet on 1846 September 23, within 1° of Le Verrier's predicted position. Lexell, Anders Johan (1740-84) Swedish astronomer, born in Abo (modern Turku, Finland), who spent most of his career (1768-80, 1782-84) at the St Petersburg Academy of Science and specialized in computing cometary orbits. He computed the orbit of a comet discovered by Charles Messier, and found it to have a period of just 5.5 years - the first known example of a 'short-period' comet. Lexell correctly deduced that comets are much less massive than the major planets, whose orbits they did not perturb, even during close encounters. He was the first to prove the planetary nature of Uranus (it was originally suspected to be a comet). Lexell, Comet (D/1770 L1) First short-period comet on record. Discovered by Charles MESSIER, it is one of the best-known cases of a cometary orbit having been altered considerably after being perturbed by the gravitational pull of the massive planet Jupiter. In 1770 this comet, in its approach towards perihelion, passed between the satellites of Jupiter. Later, on 1770 July 1, it came within 2.5 million km (1.6 million mi) of the Earth. As it passed by, the transient gravitational grasp of the Earth caused a decrease in the comet's period by almost three days, but the change in the period of the far more massive Earth was so small as to be immeasurable. The orbit of the comet was investigated by Anders LEXELL, who found it to have a period of 5.6 years. He showed that the comet had been highly perturbed by Jupiter in 1767 May, when its orbit had been changed from a much larger ellipse to its present shape, which explained why it had never been seen previously. The comet was never seen again after 1770. The reason for this was provided by Pierre LAPLACE, who showed that a second close approach to Jupiter had occurred in 1779. On this occasion it had passed so close to Jupiter that its orbit was altered dramatically, with large changes in its orbital period and perihelion distance. libration Small oscillation of a celestial body about its mean position. The term is used most frequently to mean the Moon's libration. As a result of libration it is possible to see, at different times, 59% of the Moon's surface. However, the areas that pass into and out of view are close to the LIMB and therefore extremely foreshortened, so in practice libration has less of an effect on the features that can be clearly made out on the Moon's disk than this figure might suggest. libration Although the Moon is in synchronous rotation with respect to the Earth, ground-based observers can still, over the course of several lunations, see significantly more than just half of its surface. Libration in longitude (top) allows the observer to see slightly around the mean east or west limb, while the tilt of the lunar axis relative to the Moon’s orbital plane allows regions beyond either pole to be seen on occasion. Physical libration results from slight irregularities in the Moon's motion produced by irregularities in its shape. Much more obvious is geometrical libration, which results from the Earth-based observer seeing the Moon from different directions at different times. There are three types of geometrical libration. Libration in longitude arises from a combination of the Moon's SYNCHRONOUS ROTATION and its elliptical orbit. As a result, at times a little more of the lunar surface is visible at the eastern or western limb than when the Moon is at its mean position. 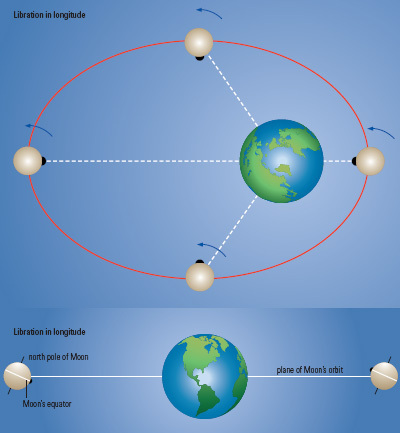 Libration in latitude arises because the Moon's equator is tilted slightly from its orbital plane, so that the two poles tilt alternately towards and away from the Earth. A smaller effect is diurnal libration, by which the Earth's rotation allows us to see more of the Moon's surface at its western limb when it is rising, and more at the eastern limb when it is setting. Lick Observatory Major optical observatory, and the first in the United States to be built on a mountain-top site. Its telescopes are on Mount Hamilton, about 32 km (20 mi) east of San Jose, California, at an altitude of 1280 m (4200 ft). Its first director was Edward S. HOLD-EN. The observatory was the result of a bequest to the University of California by an eccentric millionaire, James Lick (1796-1876), whose body lies beneath the pier of the 0.9-m (36-in.) Lick Refractor. Inaugurated in 1888, the telescope was for nine years the largest in the world, and it remains the world's second-largest refractor. With it, Edward E. BARNARD discovered Amalthea in 1892, the first Jovian satellite to be found since 1610. The front element of its objective lens was refigured in 1987, having suffered long-term damage from atmospheric corrosion. Several other telescopes are on Mount Hamilton, including the Crossley 0.9-m (36-in.) reflector, once owned by Andrew COMMON, and the 1-m (39-in.) Nickel Reflector, built in 1983. The largest telescope at Lick is the C. Donald Shane Telescope 3.05-m (120-in. ), completed in 1959 and named after a former director. Lick Observatory is still operated by the University of California Observatories, with headquarters in Santa Cruz. life in the Universe The study of the possible existence of life in the Universe beyond the Earth is variously termed bioastronomy, astrobiology and exobiology. It covers questions on the existence of life on other planetary bodies in the Solar System, such as Mars and Europa; the study of organic molecules in giant molecular clouds and circumstellar material (see INTERSTELLAR MOLECULES) and in comets and meteorites; the study of planetary surfaces and atmospheres; questions of the origins of life, whether on the Earth or elsewhere (see also PANSPERMIA), and the range of conditions under which it can survive; and the search for life in space, by 'listening' for intelligent signals (see SETI) and investigating extrasolar planets. life in the Universe An artist’s impression of the Darwin spacecraft, which will be used for observations of planets around other stars. To be stationed at the L1 Lagrangian point, these craft are designed to operate as a free-flying optical interferometer, with six 1.5 m (49 in.) telescopes sending their collected light to a central hub. The first truly scientific ideas (as opposed to philosophical speculation on the 'plurality of worlds') on the possibility of extraterrestrial life followed the invention of the telescope. Early ideas were entirely anthropocentric and shaped largely by contemporary religious beliefs. In the late 18th century Immanuel Kant (1724-1804) formalized these ideas, proposing that all planets would have their own appropriate inhabitants matched to the conditions that prevailed upon them. There were suggestions that the Moon, with its 'terrae' and 'maria', and even the Sun, were inhabited. With improvements in telescope design during the 19th century, Mars became a focus of attention. The planet was soon being described as a world of reddish 'continents', dark 'seas' and white icy polar caps that grew and shrank with the passing of the Martian seasons. Some concluded that Mars might support life or even be inhabited. Schiapar-elli's identification of dark linear streaks - canali - on the Martian surface sparked a major debate on whether these features were natural or artificial (see CANALS, MARTIAN). By the mid-20th century new instruments and techniques had revealed Mars as a world incapable of supporting any form of reasonably advanced terrestrial life. However, a small number of scientists continued to hope that relative simple forms of primitive life such as lichens might be found there. That hope died in 1964, when the first successful flyby of Mars, by the Mariner 4 spacecraft, revealed a cold, arid Moon-like surface showing no visible evidence of life. To search for extraterrestrial life, astronomers must first decide exactly what to look for. Only carbon seems able to build the backbones of the complicated molecules required for life. (Although silicon can form long-chain molecules, its ability to do so is limited and there is no evidence that silicon-based life is possible.) In addition to carbon there are just five other elements that are found in all metabolizing living organisms, hydrogen, nitrogen, oxygen, phosphorus and sulphur - CHNOPS for short. Other elements - sodium, magnesium, chlorine, potassium, calcium, iron, manganese, copper and iodine - are regularly but not always found in living cells. Altogether, two-thirds of the 92 naturally occurring elements are found in various living organisms, but never all together in the same one. Clearly, living material is distinguished from the inanimate not by its constituent atoms, but by its complex organized structure and active metabolism. As the CHNOPS elements are among the commonest and most abundant in the Universe, it is probably safe to assume that life, wherever it exists, is based on these same elements. Life can be broadly defined as a chemical process, seemingly unique to carbon, that draws energy from its local environment to generate and maintain structural complexity. In so doing it reduces local entropy, thus increasing the total entropy of the surrounding Universe. The search for life is therefore a search for evidence of departures from thermodynamic and chemical equilibrium that are associated with biological activity. Until recently, the list of Solar System objects considered worth searching for evidence of life automatically excluded worlds devoid of an atmosphere, and those outside the Sun's ECOSPHERE (or habitable zone), whose limits correspond quite closely to the orbits of Venus and Mars. Although Venus has a dense atmosphere, space probes have revealed it to be hostile to life in every way. Mars, at the outer limit of the Sun's ecosphere, appears to be a possible if uncertain abode of life. The surface chemistry of Mars at two different sites was investigated in 1976 by the sophisticated landers of the two VIKING missions. They revealed no unequivocal evidence for the existence of Martian life. It was concluded that, at the present epoch at least, Mars is devoid of life, implying that any extraterrestrial life would have to be sought beyond the Solar System (see EXTRASOLAR PLANET). Interest in searching for life within the Solar System has been revitalized by a succession of major discoveries about the extreme limits of life on Earth. It was formerly assumed that the region extending several kilometres below the Earth's surface was essentially sterile. In the late 1970s, the first hot hydrothermal plumes and 'black smokers' - hydrothermal outflows rich in heavy metal sulphides - were discovered rising from the slopes of seafloor ridges 2-3 km (1.25-2 mi) down. Several hundred smokers are now known, they have temperatures of as much as 620 K (at this depth, water boils at ~670 K). The regions surrounding these vents harbour one of the most extraordinary ecosystems on Earth. Under enormous pressure, in complete darkness without energy from the Sun, are microorganisms that feed on the chemicals that rise from deep inside the Earth, many living at temperatures of ~380 K.
In 1993 new species of microorganisms were collected from rocks 2.7 km (1.7 mi) below ground - anaerobic organisms that die when exposed to oxygen, having little resemblance to the typical microbes found on the surface, thriving at an ambient temperature of ~350 K. (Similar thermophilic microbes colonize volcanically heated geysers and springs, such as those in Yellowstone National Park, and hydrothermal plumes on the ocean floor.) Present evidence indicates that subsurface life may extend to ~4 km (2.5 mi) below the continental crust and ~7 km (4.5 mi) below the oceanic crust. An entirely new library of names has entered biology for microorganisms that occupy a new branch of the tree of life - the Archaea. This branch includes microbes that thrive at very high temperatures - thermophiles and hyperthermophiles, at very high pressures -baryophiles, and in hyper-saline environments -halophiles; organisms that metabolize methane or sulphur compounds - methanogens and thiophiles: microbes that thrive at very low temperatures - cryophiles; organisms that live within rocks - lithophiles; and even organisms that live in the most acid and alkaline environments that would rapidly dissolve and destroy most other life forms. Other microorganisms show extremely high levels of tolerance to intense UV and nuclear radiation, some can resist almost total dehydration, and some can survive being in a vacuum for biologically long periods of time. (Interestingly, hyper-thermophiles may be the oldest surviving form of terrestrial life, and clearly would have been well adapted to the conditions that prevailed more than 4 billion years ago, shortly after the Earth formed.) Microorganisms living in extreme environments are collectively referred to as extremophiles. The discovery that terrestrial life seems to have filled every possible environmental niche, above and below the surface, suggests that subsurface life may exist on other planetary bodies in the Solar System, even if their surfaces are totally inhospitable. The essential requirement is that water is present and that the internal heat flow and pressure allow liquid water to exist at some depth, forming a subsurface ecozone. Subsurface conditions suitable for some form of extremophile life range from small circum-polar regions on MERCURY - (if water/ice is present there) to the distance of Pluto. Pluto and its satellite Charon are locked by spin-orbit coupling, and solar tides squeezing Charon could be maintaining a subsurface layer of liquid water, providing a suitable environment for cryophiles. This range extends far beyond the limits of the conventionally defined ecosphere. For the foreseeable future, only targets in the Solar System will be accessible for close observation from orbit or direct investigation of their surfaces, though the search for extrasolar planets may reveal some clues. The four planetary size satellites of Jupiter and Saturn's large moon Titan are major candidates in the search for life. Titan's thick atmosphere is mostly nitrogen, with measurable quantities of methane and ethane, and there is potential for some form of cryophilic microbial life there. Results from the Galileo mission to Jupiter show that Europa and Ganymede, and possibly Callisto, possess subsurface oceans. Both Europa and Ganymede possess internal heat sources, in part derived from tidal heating, and are strong candidates for the existence of some form of widespread or localized submarine hydrothermal vent activity - perhaps capable of supporting chemosynthetic ecosystems (see also EUROPA ORBITER). The search for traces of past or extant microbial life on Mars is already under way, and the question whether surface or subsurface life once existed or still exists there may be answered in the first half of the 21st century. Subsurface environments conducive to chemosyn-thetic microbial life cannot be limited to the Solar System, and can be expected to be common throughout the Universe. The most widespread and abundant forms of life in the Universe will most likely have more in common with microorganisms than with the complex multi-cellular organisms that characterize the life on the Earth's surface. light, velocity of The value for the velocity of light (and of all other forms of ELECTROMAGNETIC RADIATION) in a vacuum, usually symbolized as V, was officially recognised as 299,792,458 m/s by the International Astronomical Union (IAU) in 1976. For many purposes, however, the approximate value of 300,000 km/s (3 X 108m/s) is sufficient. One of the first attempts to measure the velocity of light was made by GALILEO in 1600, prior to that, most scientists had expected its velocity to be infinite. Galileo and an assistant stood about a kilometre apart with lanterns. When the assistant saw a flash from Galileo's lantern, he briefly opened the cover on his own. Galileo then attempted to measure the time lag between uncovering his own lantern and seeing the flash from the other lantern. Needless to say, the experiment failed since the reaction times involved were ten thousand times longer than the light flight times. The first reasonably successful determination of c was made be Ole ROMER in 1676. He had been observing and timing transits and occultations of Jupiter's Galilean satellites, when he noticed that the events were occurring later than he had predicted on the basis of earlier observations. Romer realised that this was because the Earth and Jupiter had moved around their orbits and were further apart than when he had made the previous observations. The delays in the occurrence of the satellite phenomena therefore arose because of the time it took light to cross the increased distance between the planets. From his measurements, Romer determined a velocity of 240,000 km/s for light. Hippolyte FIZEAU made the first 'laboratory' determination of c in 1849. He shone light on to a mirror placed nearly 9 km (6 mi) away and looked at the reflection. Both the outgoing and returning beams passed between the teeth of a rotating gearwheel. At slow rotations, the returning beam would pass through the same gap between the teeth of the gearwheel as the outgoing beam, and so could be seen. When the speed of rotation was increased, there would come a point where the returned beam was intercepted by the next tooth, and so could not be seen. Increasing the speed still further enabled the returning beam to be seen again as it passed through the gap next to the one used by the outgoing beam. The number of teeth on the gearwheel (720) and its rotational velocity (1500 rpm) when the returning beam was seen for the second time, provided Fizeau with the time taken by light for the return journey, and from this he found a velocity for light of 315,000 km/s. As his apparatus was refined, Fizeau was able to show that light passing through moving water had a higher velocity when it went with the flow rather than against it, and in 1853 Leon FOUCAULT showed that the velocity was lower in water than in air. Experiments like these led to the expectation that the velocity of light would vary depending on whether a light beam was travelling in the same direction through space as the Earth, or in the opposite direction. So in 1887 the German-American physicist Albert Michelson (1852-1931) and the American chemist Edward Morley (1838-1923) conducted their famous experiment (see MICHELSON-MORLEY EXPERIMENT). Their failure to detect the Earth's motion by finding a changing velocity for light led directly to the idea that the velocity of light was constant for all observers, whatever their motion, and so to EINSTEIN'S theory of SPECIAL RELATIVITY. Michelson later (1926) determined a value of 299,796 km/s for the velocity of light, using a variation of Fizeau's method, with the light beam reflected out to and back from a mirror 35 km (22 mi) away via a rotating octagonal prism. For astronomers, a consequence of the finite velocity of light is that objects are seen as they were when they emitted the light that is now received, not as they may be today. An object one light-year away is seen as it was a year ago and so on. For more distant objects, this 'look back' time, can be very large, as much as 1010 years or so for the most distant quasars. Some objects may thus have changed radically or even no longer exist, though they can still be seen in the sky. Thus the 1987 SUPERNOVA in the Large Magellanic Cloud could still be seen as a star 170,000 years after it had actually exploded. light, Visible ELECTROMAGNETIC RADIATION,with wavelengths from about 380 to 700 nm, that may be seen by the human eye. The nature of light is now thought to be fairly well understood, yet it was the subject of controversy for more than 200 years, as experimenters uncovered conflicting evidence of its nature. Some evidence suggested that light was composed of individual particles, other evidence suggested that it was composed of waves. It was even found necessary to invent a substance to carry these waves, the so-called luminiferous ether, which is now known not to exist. Not until the pioneering experiments of the Scottish physicist Thomas Young (1773-1829) was the wave-like nature of light firmly established for the scientific community. EINSTEIN,how-ever, in his 1905 explanation of the photoelectric effect then showed that light also behaved as though it were a stream of particles. It is now known that light is both particle and wave. That is, that light comes in small packets, called PHOTONS. This is true whether light, radio waves or X-rays are considered (all of which are types of electromagnetic radiation). This packet is composed of an electric field and a magnetic field, each of which 'oscillates' at right angles to its direction of motion. The interaction of these fields was first described in mathematical form by James Clark MAXWELL. His laws are now known to all students of physics as 'Maxwell's laws' and are the basis of the study of electromagnetism, the study of all phenomena related to the interactions of electric and magnetic fields. Despite the opening-up of other regions of the ELECTROMAGNETIC SPECTRUM in recent years, our picture of the Universe is still largely based on what we actually see, that is, the information brought to us by light. light cone In a spacetime diagram, line or curve that represents the path of a light ray. Spacetime diagrams are graphical three-dimensional representations of four-dimensional SPACETIME. Any journey through spacetime is represented by a line or curve in such diagrams. The path of a light ray emanating from a particular point forms a cone with an angle of 45° from the vertical; these cones are called light cones. Any journey by matter through spacetime must be slower than the speed of light, thus forming a line or curve making an angle less than 45° with the vertical time axis. light cone Events in spacetime can be mathematically modelled in terms of a double cone. In this model, the event lies at the tip of the cones. 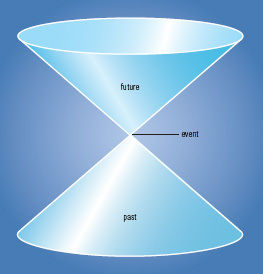 Time runs vertically, so that the upwarddirected cone coming away from the event represents the future, while the downwarddirected cone is the past. The past converges upon, while the future diverges from, the event. light-curve Graph of the variation with time of the brightness of an astronomical body (usually a variable star). light-curve A plot of the magnitude (brightness) of Nova Delphini 1967 against time. 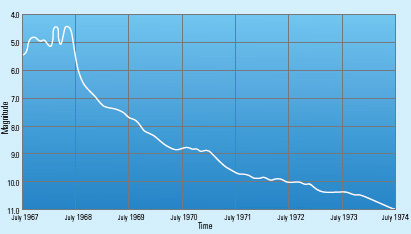 The nova was slow to arrive at peak brightness, showing several maxima over a twelve-month period, before its light-curve entered a long, gradual decline. light pollution Effect of street and other lighting concentrated mainly in urban areas on astronomical observing and imaging. For amateur astronomers, it limits the celestial objects (particularly extended objects) that can be seen. For professional astronomers its effects can so impede or distort scientific observations as to result in the eventual closure of observatories enveloped by urban sprawl in the years since their foundation. light-year (l.y.) Unit of distance measurement equal to that travelled by a ray of light, or any electromagnetic radiation, in a vacuum in one tropical year. Light travels at a speed of 300,000 km/s and so a light-year is equivalent to 9.4607 x 1012 km, 0.3066 parsecs, or 63,240 astronomical units. limb Extreme edge of the visible disk of the Sun, Moon or a planet. The term could refer to any celestial body that shows a detectable disk. The limb on the same side as the direction of travel of a body is called the preceding limb, and that farthest away, the following limb. limb brightening Increase in brightness from the centre to the limb of an astronomical body. Observing the effect suggests looking at the surface of an object rather than its atmosphere, since atmospheres typically display limb darkening. limiting magnitude (1) Faintest magnitude visible or recordable by photographic or electronic means. It depends on aperture, sky transparency, seeing, exposure and sensitivity of the eye or recording apparatus. (2) Faintest magnitude of objects shown in a star atlas or listed in a catalogue. Lindblad, Bertil (1895-1965) Swedish astronomer who directed Stockholm Observatory (1927-65). He identified the Galaxy's spiral structure and its differential rotation. He correctly determined that the distance to the galactic centre is about 50,000 l.y. and confirmed Harlow shapley's model that located the galactic centre in Sagittarius. Lindblad's other major research involved studies of star clusters and their structure, and the use of spectroscopy to establish luminosity criteria for stars that allowed main sequence and giant stars to be differentiated. Lindblad resonance Resonance that occurs when the rotational period of the spiral pattern of a spiral galaxy is such that the stars are at the same point in their epicyclic motions each time the star passes through one of the arms. The inner Lindblad resonance occurs where the stars are moving faster than the spiral pattern, and the outer Lindblad resonance occurs where they are moving slower. For our galaxy, these resonances occur at about 12,000 l.y. and 50,000 l.y. from the centre of the Galaxy respectively. The Lindblad resonances mark the limits of the region where spiral density waves can form spiral arms within a galaxy. Linde, Andrei Dmitrievitch (1948-) Russian cosmolo-gist, professor of physics at Stanford University, with Alan guth one of the originators of the inflation, a model of the very early Universe (up to just 10 ~37 s after the big bang). By causing an initial rapid expansion, inflation accounts for certain observed properties of the Big Bang Universe. Linde advocates 'chaotic inflation', which allows many 'self-reproducing' or 'parallel' universes to branch off from a parent universe; these separate universes may differ completely from one another in their physical properties. LINEAR, Comets Comets discovered by the MIT Lincoln Laboratory Near Earth Asteroid Research Project (LINEAR). Established in 1998 March, LINEAR employs two 1-m (0.39-in.) telescopes sited at White Sands, New Mexico, USA, to search for potentially hazardous minor planets. The patrol, using wide-field CCD cameras, has been very successful and has also led to the discovery of several comets: as of late 2001 the comet discovery total stood at over 60. Among the most notable of these comets was C/1999 S4 (LINEAR), discovered on 1999 September 27. Orbital calculations suggested that this comet would become a reasonably bright object around perihelion, 0.77 AU from the Sun, on 2000 July 26. The comet showed unusual activity in early July, shedding at least one fragment from its nucleus. Following a slight brightening around July 20-21, the comet broke into a cloud of smaller fragments, and, as the released gas and dust dispersed, it faded rapidly from view. Among other LINEAR discoveries, C/2001 A2 became a bright binocular object prone to outbursts in June and July of 2001, and 2000 WM1 became bright in late December 2001.
line of nodes Line of intersection of the orbit plane of a body with the reference plane used for the orbit. It is the line joining the ascending node and the descending node. For the planets the reference plane is the ecliptic, and for satellites it is usually the equator of the planet. See also inclination; regression of the nodes. LINER (acronym for low-ionization nuclear emission-line region) Common type of galactic nucleus defined by the ratios of (usually weak) emission lines. Some LINERs are clearly low-power active galactic nuclei, judged by the presence of weak broad lines similar to those in type 1 seyfert galaxies or associated radiation in the ultraviolet, radio or X-ray regions. Other LINERs are connected to starburst galaxies, either by having gas excited by shocks in the winds blown from starbursts or photo-ionized by unusually hot stars as the starburst progresses. At low levels, most luminous galaxies have a LINER nucleus. line spectrum spectrum that exhibits absorption lines superimposed on a continuum; emission lines superimposed on a continuum; or emission lines with no continuous background. Line spectra are found within the entire electromagnetic spectrum, from the gamma-ray domain to radio. Stars have mostly absorption spectra, though some have emission spectra as well. Nebulae have emission spectra. Linne Lunar crater (28°N 12°E), 1.5 km (1 mi) in diameter. Located in Mare serenitatis, Linne is one of the youngest visible craters on the Moon (a few tens of millions of years old). It is bowl-shaped and circular, with a bright collar of ray material surrounding it, which in Earth-based telescopes is lacking in discrete rays. Linne has been the focus of much debate over supposed changes across time, though none of these have been substantiated. Lippershey, Hans (or Lipperhey, Hans) German-born lens-maker who worked in Middelburg, in the Netherlands. In the early 1600s he began to experiment with combinations of spectacle lenses, and eventually crafted a small refracting telescope of the kind subsequently used by galileo. He was one of three Dutch opticians who claimed to have invented the telescope - the others were Jacob Adriaanzoon (1571-1635) and Zacharias Janszoon (1580-C.1638) -but Lippershey was the first (in 1608 October) to apply for a patent for the invention. lithosphere Outer semi-rigid shell of a planetary body; it is capable of supporting significant stresses. Its definition is based on mechanical properties, unlike the crust, which is defined by composition. On Earth, the lithosphere comprises the whole of the crust, together with the uppermost layer of the underlying mantle. lithium (symbol Li) Third element and the lightest of the metals; it is about 80th in order of cosmic abundance. Its properties include: atomic number 3; atomic mass of the naturally occurring element 6.941 amu; melting point 453.7 K; boiling point 1620 K. Lithium has five isotopes, two of which are stable and form the naturally occurring element (lithium-6, 7.4%, and lithium-7, 92.6%). The abundance of lithium is far higher in the interstellar medium than it is in stars. This is because lithium is produced in the interstellar medium by cosmic ray impacts with carbon, oxygen and other nuclei. It is quickly destroyed in stars because it undergoes nuclear reactions at temperatures as low as 500,000 K. Lithium thus acts as an important initiator in protostars to start the hydrogen-burning reactions. Little Dumbbell (M76, NGC 650 and NGC 651) planetary nebula in northern Perseus (RA 01h 42m.4 dec. +51°34'). At mag. +10.1, it is reckoned to be the most difficult to observe of the Messier objects. Like the dumbbell, M76 shows two principal conspicuous lobes of nebulosity, each of which has been given its own NGC designation. M76 has an apparent diameter of 65", and lies at a distance of 3400 l.y. It is sometimes described as the Butterfly Nebula. Liu Xin (or Liu Hsin) (c.ad 50) Chinese school minister and astronomer who was one of the earliest cataloguers of stars in recorded history. Predating Ptolemy's Almagest by almost 100 years, Liu Xin's catalogue of over a thousand bright stars assigned stars to six different magnitude categories. He very accurately calculated the true length of a year as 365.25 days. Liverpool Telescope Fully robotic, 2.0-m (79-in.) telescope at the roquede los muchachos observatory operated by Liverpool John Moores University. Unlike the identical faulkes telescopes, it was built primarily for university research and teaching, and uses both imaging and spectroscopy. It became operational in 2002.
lobe Region around an ANTENNA where reception (or transmission) varies in intensity. An antenna neither radiates nor receives radio waves equally in all directions; similarly a RADIO TELESCOPE receives radiation preferentially in one direction but also from other directions too. A number of distinct lobes exist, resembling the petals on a daisy. The main lobe is in the direction of best reception (or transmission), where the telescope/antenna is pointing. All the others are called side lobes and are usually unwanted. When a radio telescope points at a faint astronomical object in the main lobe, the side lobes may pick up electrical interference from ground-based appliances such as microwave ovens. A good design keeps the magnitude of these side lobes to a minimum in most cases. lobe Region, usually one on each side, of radio emission from high-energy particles. The radio lobes are mostly associated with RADIO GALAXIES, and there is one on each side of the galaxy, connected to it by a JET. local arm Segment of one of our GALAXY'S spiral arms within which the Sun is located. It is also known as the ORION ARM. local bubble Volume of interstellar space that encloses the Solar System and other nearby stars. The gas density within the bubble is only about 10% of the average for the interstellar matter. The bubble may be the result of a supernova explosion some time in the past. The bubble is about 300 l.y. across and the Solar System is about 40 l.y. from its edge. Local Group Small group of about 40 galaxies that includes our GALAXY, the two MAGELLANIC CLOUDS, the ANDROMEDA GALAXY and the TRIANGULUM GALAXY; most are DWARF GALAXIES. They are distributed over a roughly ellipsoidal space, about 5 million l.y. across. All the members are gravitationally bound so that, unlike more distant galaxies, they are not receding from us or from one another. 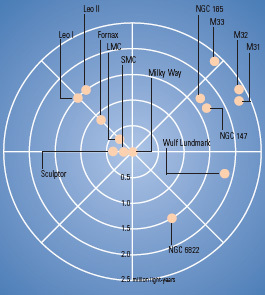 Local Group A map of galaxies in the neighbourhood of the Milky Way. Members of this Local Group are gravitationally bound to one another. As shown in this plot, centred on our Galaxy, the closest neighbours are the Magellanic Clouds and Sculptor Dwarf. local standard of rest (LSR) Frame of reference, centred on the Sun, in which the average motion of the stars in the immediate vicinity is zero. Each star, including the Sun, in a volume of space about 330 l.y. in diameter, is moving relative to the local standard of rest, with the Sun moving in the direction of the solar APEX. The zero point for the local standard of rest is an imaginary point in the galactic plane moving clockwise in a circular orbit around the galactic centre at a velocity of about 220 km/s (140 mi/s) with a period equal to that of the Sun. Astronomers measure a star's velocity components with respect to the LSR rather than to the Sun, because the Sun's orbit around the galaxy is slightly non-circular. local supercluster Group of galactic clusters that contains our LOCAL GROUP of galaxies and several other clusters. The Virgo, Centaurus and Ursa Major Clusters are among the clusters contained in our local supercluster. The local supercluster contains more than 4500 galaxies. local thermodynamic equilibrium (LTE) Simplifying approximation used when constructing computer models of stellar atmospheres. The equations describing the properties of gases and plasmas, such as pressure and excitation, are characterized by one temperature; the equations describing the radiation are characterized by another, different, temperature. local time Time at any given location on the Earth's surface, measured either as MEAN SOLAR TIME or APPARENT SOLAR TIME. Local time varies around the globe with longitude, with a difference of 15° longitude equating to a difference of one hour in local time. By convention, the Earth is divided into 24 TIME ZONES, each one hour apart from its neighbours, but for convenience the civil time kept in these zones may vary from actual zone time, depending on centres of habitation. In the summer, many countries also adopt daylight saving time, advancing their clocks by one hour. Lockyer, (Joseph) Norman (1836-1920) English amateur astronomer who discovered the previously unknown chemical element helium in the Sun. From 1857 he worked at Britain's War Office, taking up astronomy and other scientific researches in his spare time and constructing a private observatory at his home in Hampstead. From 1864 Lockyer began to study the Sun almost exclusively after hearing of Gustav KIRCH-HOFF's discovery in 1859 that the solar spectrum contained lines indicating the presence of sodium atoms. After discussions with William HUGGINS, Lockyer attached a small dispersion spectroscope to his own telescope in the hope of making similar discoveries. In 1868 he found, independently of Jules JANSSEN, that solar prominences produced bright, yellow emission lines. One of these lines did not appear in any laboratory spectrum produced by a known terrestrial chemical element, so Lockyer suspected that it was produced by a 'new' element, which he named 'helium', after the Greek word for 'Sun'. It was not until 1895 that William Ramsay (1852-1916) managed to isolate helium from a terrestrial source. This discovery proved the worth of astronomical spectroscopy. In 1869 Lockyer founded the scientific journal Nature, which he edited for 50 years. Combining astronomy and archaeology, he was able accurately to date the megalithic Stonehenge monuments by reckoning the changing position of the summer solstice sunrise since the monuments were built. In 1890 he established the Solar Physics Laboratory at South Kensington, serving as its director until 1911. He spent the rest of his scientific life at his Hill Observatory at Sidmouth, Devon, now known as the Norman Lockyer Observatory. Loki Active volcano on Jupiter's satellite IO. It was discovered on VOYAGER 1 images in 1979. Since then, continuing eruptions have been documented by infrared telescopic observations from Earth and by the GALILEO spacecraft orbiting JUPITER. Loki is the most persistently strong thermal source on Io. It is, on average, the site of about 25% of Io's global heat output. Most of the thermal radiance comes from a probable crusted lake of molten lava, to the north of which is a fissure where plumes of sulphur dioxide are propelled up to hundreds of kilometres skywards. Lomonosov, Mikhail Vasilievich (1711-65) First Russian scientist to make notable contributions to astronomy. By 1745 he was a full member of St Petersburg's Imperial Academy of Sciences, and was later appointed Professor of Chemistry at the university there. He conceived early versions of the wave theory of light and of the law of conservation of matter. Lomonosov was a strong supporter of Copernicus' theory (then unpopular in Russia). In 1761 he observed a transit of Venus, correctly deducing that the planet had a dense atmosphere. long baseline interferometry Several radio telescopes, separated by large distances, operating together as a radio interferometer, to observe astronomical objects with better resolution and to determine the positions more accurately. See also radio interferometer; very long baseline interferometry. Long March Family of satellite launchers developed and operated by China and based on an intercontinental ballistic missile first stage. In 1970 April, a Long March 1 (LM 1) launched China's first satellite; today, the country operates various LM 2, 3 and 4 boosters, some of which provide international commercial satellite launches. The LM2F has flown two tests flights of the Shen Zhou spacecraft, which will carry two Chinese astronauts into orbit in about 2002-2003. The LM3, 3A and 3B fleet offers flights to geostationary transfer orbit for payloads weighing between 1.4 and 5 tonnes. The LM4A and 4B are used to launch payloads into polar orbit. long-period comet comet for which the interval between successive perihelion returns is greater than 200 years. About 750 long-period comets are known. Many of the most spectacular comets fall within this category, with examples including west, hale-bopp, hyakutake and the kreutz sungrazers. long-period variable Alternative name for a type of pulsating giant or supergiant variable star known as a mira star, and designated 'M' in the classification scheme. In the past the term was sometimes used for any variable that had a period in excess of 100 days, but this led to confusion and such usage is now discouraged. The abbreviation 'LPV' is commonly used in discussion of stars of this type. Lorentz, Hendrik Antoon (1853-1928) Dutch mathematical physicist who won the 1902 Nobel Prize for Physics for his mathematical model of the electron. He suggested, independently of George Francis Fitzgerald (see fitzgerald contraction), that bodies moving at relativistic speeds (that is, near the speed of light) contract. He developed lorentz transformations (1904) to describe this contraction, the tendency of these bodies to increase in mass, and the phenomenon known as time dilation - all important aspects of the theory of special relativity. Lorentz transformations Set of equations, worked out by Hendrik lorentz, which relate space and time coordinates in frames of reference that are in uniform relative motion (see relativity). The space and time coordinates (x1, y1, z1, t1) in the first frame of reference are related to those in the second, (x2, y2, z2, t2). Lovell, (Alfred Charles) Bernard (1913- ) British radio astronomer responsible for building the radio telescope at Jodrell Bank, near Manchester. Early in his career, Lovell studied cosmic rays; after World War II he built on his wartime radar research by using a 4.2-m (14-ft) radar telescope to study the ionized radio echoes produced by meteors. In 1950 he offered the first definitive explanation for the phenomenon of scintillation produced by Earth's ionosphere, which can propagate and amplify incoming or distant radio waves. This phenomenon, also known as scattering, is useful for studying the solar wind and for measuring the angular sizes of extraterrestrial radio sources. Lovell built a 66.5-m (218ft) wire bowl-shaped transit radio telescope that was used by Robert Hanbury brown and others to detect the first radio waves from the Andromeda Galaxy. In 1951 Lovell was appointed professor of radio astronomy at Manchester University, and six years later his dream of a radio-astronomy observatory was realized when Jodrell Bank, now the nuffield radio astronomy laboratory, was opened. Its primary instrument is a 76-m (250-ft) fully steerable parabolic dish receiver on an altazimuth mount, completed in 1957. That was the same year that the Russian sputnik 1 satellite was launched, and Lovell was able to justify the expense of the great radio telescope - originally known as the Mark I, but renamed the lovell telescope in 1987 - by using it successfully to track the then-feared spaceship. In the 1960s he collaborated with Fred whipple to make important studies of flare stars simultaneously at radio and optical wavelengths, an observational technique now routinely used on all types of astrophysical objects. Lowell, Percival (1855-1916) Wealthy American diplomat and amateur astronomer from a distinguished family; he built the lowell observatory and became famous for his observations of Mars and his theory that the planet was inhabited by intelligent beings. Lowell graduated from Harvard in 1876 with a distinction in mathematics. During the 1880s and 1890s, he spent time on diplomatic missions to japan and Korea. Around 1890 he became enthused by the Mars observations of Giovanni schia-parelli and the theories that the planet might be inhabited by sentient life forms made popular by Camille flammarion and others. Four years later, largely to determine whether these theories were true, Lowell built a private observatory at Flagstaff, Arizona, just in time for the 1894 opposition of Mars. For the next two decades, Lowell used his observatory's refractors (the largest a 24-inch (600-mm) completed by alvan clark & sons in 1896) to study Mars closely. He concluded that the network of straight, dark lines that Schiaparelli had called canali was a global irrigation system, constructed by intelligent beings determined to save their planet from drought by transporting water from the planet's polar icecaps to its arid temperate and equatorial regions. He set out his theories in three popular books - Mars (1895), Mars and its Canals (1906) and Mars as the Abode of Life (1908) - and produced intricate maps of the canal network. Today, the Martian canals are regarded as a mere optical illusion and historical curiosity. Although he was criticized for his bold, even unscientific approach to the question of life on Mars, Lowell left a rich astronomical heritage through his observatory. During the last eight years of his life he initiated a search for a trans-Neptunian planet that led to Clyde tombaugh's discovery of Pluto in 1930. It was Lowell who in 1914 urged Vesto M. slipher to make the observations that led to the discovery of galaxy redshifts two years later. Lowell Observatory Observatory founded in 1894 by Percival lowell at Flagstaff, Arizona, at an altitude of 2200 m (7300 ft). It is managed by a sole trustee who is a Lowell descendant, while an internal advisory board and director supervise day-to-day operations. It is famous for Lowell's investigations of Mars, Vesto M. slipher's discovery of galaxy redshifts, and Clyde tombaugh's discovery of Pluto. The observatory's first major telescope was a 0.6-m (24-in.) refractor built in 1896. A second site at Anderson Mesa, south-east of Flagstaff, hosts the Ohio Wesleyan University's 1.83-m (72-in.) reflector, operated jointly with Ohio State University. lower culmination Passage of a circumpolar star across the meridian between the pole and the horizon. At this point the star's hour angle is exactly 12h. Circumpolar stars do not set below the observer's horizon and therefore cross the meridian twice during each sidereal day, once at lower culmination and once at upper culmination, between the pole and the zenith. low-surface-brightness galaxy galaxy whose surface brightness falls well below those of the familiar luminous spirals and elliptical galaxies, either because it contains very few stars or because its stars are spread over an unusually large area. Such galaxies range from dwarfs to very luminous systems, and may be quite gas-rich. The type example, Malin 1, is a spiral behind the virgo cluster; its disk is invisible on typically exposed images. Although difficult to detect, low-surface brightness galaxies may be quite common and account for an important fraction of the total mass in galaxy clusters. L star New spectral class formally added in 1999 to the cool end of the spectral classification system (as were tstars), making the sequence OBAFGKMLT. The class was needed as a result of the ability of new infrared technologies to find cool, red - really infrared -stars. L stars are characterized by deep red colours and no hydrogen lines; metallic hydrides (CrH, FeH) replace the metallic oxides (TiO and VO) of mstars. TiO is still present in the warmer L types, but it precipitates into solid mineral form and disappears completely in the cooler types. L stars exhibit powerful, remarkably broad resonance lines of the alkali metals sodium, potassium, rubidium and caesium. Temperatures range from 2000 K at L0 down to around 1500 K at L9, and are so low that visual radiation is effectively non-existent (that is, L stars in general have no visual magnitudes, only red and infrared magnitudes). The masses of L stars range downwards from about 0.08 solar mass, which is near the critical mass required for full hydrogen fusion to operate. The warmer L stars are a mixture of real stars just off the end of class M and brown dwarfs. The cooler L stars are all brown dwarfs. Unlike the traditional classes, there are no giant or super-giant L stars because giants and supergiants cannot become so cool. Like cool M stars, L stars are convective and should possess no magnetic fields (which are thought to be anchored on radiatively stable cores). Also like cool M stars, L stars have been seen to flare, which is the only form of variation known among them. luminosity Total amount of energy emitted by a star per second in all wavelengths. It is dependent on the radius of the star and its temperature. Luminosity is usually expressed in units of watts. luminosity function Numerical distribution of stars (or galaxies) among different values of luminosity or absolute magnitude. Values of the luminosity function are usually expressed as the number of stars per cubic parsec within a given range of luminosity or absolute magnitude. The value of the luminosity function in the solar neighbourhood increases to a maximum at absolute magnitudes of 14-15, and decreases again at higher (fainter) magnitude values. This implies that faint M-type dwarfs of about one ten-thousandth of the solar luminosity are the most abundant type of star locally. Luminosity functions can also be plotted for special categories of object, such as stars of particular spectral classes, stellar clusters, galaxies or clusters of galaxies. Luna Series of 24 spacecraft used (1959-76) by the Soviet Union for robotic exploration of the Moon. The first three were named Lunik. The programme was marked by a number of notable successes. Lunik 3 returned the first views of the lunar farside in 1959 October. Luna 9 became the first spacecraft to achieve a soft landing on the Moon in 1966. Later that year, Luna 10 became the first spacecraft to enter lunar orbit. In 1970 Luna 16 completed the first automated sample return from the Moon and Luna 17 delivered the first roving vehicle, Lunokhod. Approximately 320 g of lunar material were brought back by Luna 16, 20 and 24. Lunar A Japanese dual-lunar penetrator mission to be launched in about 2002-2003 to study the lunar interior using seismometers and heat-flow probes. The penetrators will be impacted on the nearside and farside of the Moon. The Lunar A spacecraft will first be inserted into a lunar orbit with a low point of 40 km (25 mi) and the penetrators released. Small retro rockets on each penetrator will be fired and the craft will free-fall towards targets located on the nearside close to either the Apollo 12 or 14 landing sites - for comparisons between Lunar A and Apollo data - and a position near the antipodal point of some deep moonquake foci on the farside. The penetrators will impact at an estimated 8000 g and are predicted to penetrate to depths of up to 3 m (10 ft). The mother ship will fly into a 200-km (125-mi) orbit and act as the penetrators' data relay satellite. Lunar and Planetary Laboratory (LPL) Research and teaching establishment based at the University of Arizona, Tucson, and operated in conjunction with the university's Department of Planetary Sciences (PtyS). The LPL, the oldest institute devoted to planetary science, was founded in 1960 by Gerard kuiper, and the PtyS in 1973. 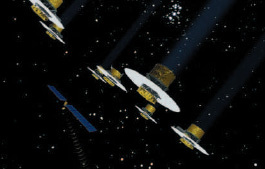 PtyS/LPL is concerned with the formation and evolution of the Solar System; it conducts spacecraft missions, laboratory-based and theoretical research, and astronomical observations. lunar eclipse Passage of the Moon through Earth's shadow. Lunar eclipses, which may be total or partial, can occur only at full moon when Sun, Earth and Moon are in line. Since the Moon's orbit is inclined at 5°.15 to that of the Earth, lunar eclipses do not occur every month; they can only happen when full moon occurs at or close to the ascending or descending node of its orbit. The westwards movement - regression - of the nodes means that lunar eclipses occur in 'seasons', separated by an eclipse year of 346.62 days. Lunar eclipses usually precede or follow solar eclipses by a fortnight. lunar eclipse Earth casts a shadow to the right in this diagram. The shadow has two components – a dark central umbra, and a lighter area of partial shadow, the penumbra. If the full moon – opposite the Sun in Earth’s sky – passes through the central cone of the umbra, a lunar eclipse will result. As the Sun is an extended light source, Earth's shadow has two components - a dark, central umbra, where the Sun is completely obscured, and a lighter outer penumbra, within which the obscuration is partial. During a lunar eclipse, the Moon passes first through the penumbra, taking about an hour, moving eastwards by its own diameter in this time, to reach the western edge of the umbra. During the penumbral phase, the light of the full moon is only slightly reduced. In some cases, where the Moon is only just too far north or south of the node to pass through the umbra, a penumbral eclipse is seen. Following first contact, the Moon's more easterly limb will show a growing dark 'nick' as it begins to enter the umbra more deeply. At a total lunar eclipse, the Moon takes about an hour to become completely immersed in the umbra. To begin with, there is little to see beyond a darkening of part of the Moon, but as the eclipsed portion increases, some colour may become evident. The curved edge of the umbra may show a slight blue fringe. Refraction of sunlight - particularly at the red end of the spectrum - through Earth's atmosphere means that the umbra is not completely dark. Consequently, the Moon does not usually disappear from view; instead, it is dimmed and often takes on a reddish colour, which becomes increasingly apparent as the umbral phase advances. At totality, the Moon - completely immersed in shadow - normally shows red, orange and yellow colours, often with some gradation. Those parts of the Moon closer to the edge of the umbra often appear somewhat brighter and more yellowish than those towards the centre, which are redder. At the distance of the Moon's orbit, the dark shadow cone of Earth's umbra subtends a diameter of about 9200 km (5700 mi). The duration of totality in a lunar eclipse depends on how nearly centrally the Moon passes through the umbra: a central passage gives a maximum duration of 1 hour 47 minutes. During totality, any lighter border on the Moon will appear to move gradually round from the westerly to the easterly limb. Totality ends when the Moon's easterly limb re-emerges into sunlight, and over the next hour or so the full moon exits the umbra to regain its usual brilliance, thereafter clearing the penumbra. No two lunar eclipses are ever quite the same, and although some dismiss them as of less interest than solar eclipses - particularly total solar eclipses, where the events centred on totality occur rapidly, in contrast with the more stately progress of a lunar eclipse - they are fascinating to observe. Lunar eclipses also have the advantage of being visible from the entire hemisphere of the Earth where the Moon is above the horizon, rather than being most impressive along a narrow track. The main difference from one event to another is the degree to which the totally eclipsed Moon is darkened, and how colourful it might be. The level of darkening is often described in terms of the danjon scale. Total lunar eclipses following major volcanic eruptions, which greatly increase the dust load and opacity of the upper atmosphere, can often be notably dark, as was the case with the 1992 December 9-10 eclipse, a year after the Mount Pinatubo eruption in the Philippines. Not only are these events relatively dark, they also lack much of the colour seen at other times. By contrast, eclipses that occur when the upper atmosphere is fairly dust-free are often bright and strongly coloured, an example being the 1989 August 17 event. Lunar eclipse brightness can also be influenced by the amount of cloud in Earth's atmosphere. The diameter of Earth's umbra is thought by some to change in response to solar activity, perhaps decreasing at solar maximum as the upper atmosphere becomes slightly more extended in response to increased ultraviolet and X-ray emissions. Many observers try to measure the precise extent of the umbra during eclipses by timing the passage of its edge across identifiable lunar features such as craters. Unless a lunar eclipse is very dark, it is usually quite easy to make out the dark maria, contrasting with the brighter, cratered highlands, with the naked eye. Telescopic observations during totality sometimes suggest that some craters, notably Aristarchus, appear markedly brighter than their surroundings. lunar meteorite meteorite that originated on the Moon. There are currently 18 known lunar meteorites, 15 of which have been collected in Antarctica. Several are gabbroic or basaltic in nature, but the majority are anorthositic regolith breccias. The rocks were removed from the Moon by impact events. Lunar Module Alan Bean begins his descent from the Lunar Module ‘Intrepid’ to join Charles Conrad on the Moon’s surface on the second, Apollo 12, landing in 1969 November. Lunar Prospector Third of NASA's low-cost, Discovery-class missions; it was intended to provide global data on key characteristics of the moon. The 296-kg spacecraft entered lunar orbit four days after its launch on 1998 January 6. From a 100-km (60-mi) circular, polar-mapping orbit, the spacecraft's suite of five science instruments was able to map the entire Moon and update existing data, largely from the Apollo era, which concentrated on the equatorial regions. One of the most dramatic 'discoveries' was the announcement that the neutron spectrometer had found a definitive signal for water ice at both of the lunar poles. Analysis of the data indicated that a significant quantity of water ice, possibly as much as 3000 megatonnes, was mixed into the regolith at each pole, with a greater quantity existing at the north pole. Further analysis showed that the suspected water ice appeared to be in discrete deposits buried under the lunar soil. Another intriguing result was the discovery of localized magnetic fields on the Moon, which were located diametrically opposite young, large-impact basins. Gravity measurements detected a number of new mass concentrations, while other data indicated that the Moon's iron core is very small. Lunar Prospector's six-month-long extended mission began in 1999 January. Swooping to within 10 km (6 mi) of the surface, it provided scientists with much higher resolution data. By the end of this phase, the spacecraft had provided a high-quality gravity map of the Moon, global magnetic field maps, and global absolute abundances of 11 key elements, including hydrogen. The dramatic finale came on 1999 July 31, when the spacecraft was deliberately deorbited and crashed into a permanently shadowed crater near the Moon's south pole. Scientists hoped that the impact might create a cloud of water vapour, proving once and for all that water exists on the Moon. However, no positive results were obtained. Lunar Rover Astronauts on the later Apollo lunar landings were able to explore greater areas of the surface aboard Lunar Roving Vehicles. 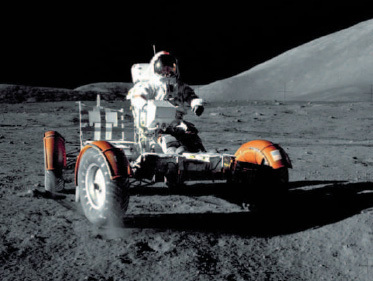 Here, Eugene A. Cernan carries out checks on the Lunar Rover on the Apollo 17 mission at the Taurus–Littrow landing site in 1972 December. lunar transient phenomenon (LTP) Short-duration (usually a few seconds to a few minutes) change observed to occur in the appearance of lunar surface features. Most LTPs are flashes or glows of light or dark obscurations of lunar features, or portions of them, documented by visual observers, but some, notably bright flashes of light that may be meteoric impacts, have been imaged by photography or CCDs. At least three different mechanisms may account for such events - impact flashes, release of gas from a vent, and the electrostatic elevation of dust. Impact events are the most easily distinguished. These are visualized as bright flashes of extremely short duration, and are caused by the vaporization of impactor and target materials. The duration of these events varies with the size of the impactor, but for the small impacts occurring now, it is in the millisecond range. While Apollo seismometers revealed numerous impact events, most were far below the visible detection limit. The larger impacts, however, may be visualized, and have recently been recorded on videotape images of the Moon during strong displays of the leonids. The release of gas, accompanied by surface dust, may also produce a temporary brightening. This would appear more as a 'glow', and would last longer (until the gas dissipated and the dust settled). One such LTP was spectro-graphically photographed in 1958 (see alphonsus), and later Apollo missions detected radon gas from orbit. A suggested mechanism is that radon gas accumulates in crustal pockets, increasing in pressure until release occurs via a conduit (fault) to the surface. This correlates with the data that such emissions are associated with maria, are locally repetitive, and occur where faults are expected to occur (the three most common areas being aristarchus, plato and Alphonsus). The electrostatic elevation of dust may produce a transient glow with obscuration of surface features. 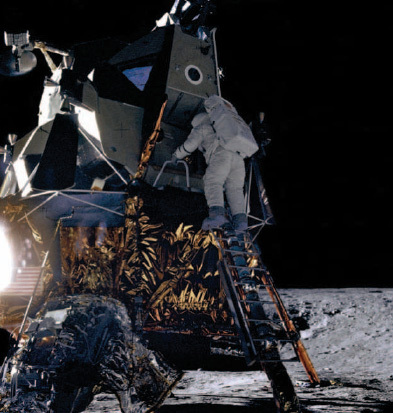 Under laboratory conditions, irradiation of lunar surface materials with ultraviolet and visible light produced an increase in electrical conductivity of several orders of magnitude. As the terminator crosses the surface, conditions may occur for sufficient electrostatic charge to levitate dust from the surface. Such events must be uncommon. lunation Time interval between one new moon and the next. It corresponds to the synodic month of 29.53059 days. Lundmark, Knut Emil (1889-1958) Swedish astronomer, from 1929 director of Lund Observatory, who studied the nature and distances of galaxies. In 1919 he found evidence suggesting that the Solar System moves in the plane of the Milky Way, concluding from further studies (1924) that this movement was rotational. Lundmark's measurements of their radial velocities (1925) suggested that galaxies are receding at velocities that increase with increasing distance - a conclusion later codified in hubble'slaw (1929). These insights were made possible by Lundmark's use of novae and supernovae (which he showed to be intrinsically very different) in other galaxies as distance indicators, based on the assumption that they had luminosities similar to their counterparts in the Milky Way. Lund Observatory Swedish observatory that can trace its roots back to 1672. Located in central Lund, it is operated by Lund University's Astronomy Department. In 1966 it opened a branch station with a 0.6-m (24-in.) reflector at Javan, 18 km (11 mi) south-east of Lund. Today, Lund Observatory astronomers use facilities such as the nordic optical telescope and the instruments of the european southern observatory. Lunokhod Name given to two Soviet automatic roving vehicles sent to the Moon. All operations were controlled from the Earth. The first was soft-landed by luna 17 in north-west Mare Imbrium in 1970 November. The second was carried by Luna 21 and touched down on the eastern Mare Serenitatis in 1973 January. Luyten, William (1899-1994) Dutch-American astronomer (born Willem Jacob Luyten) who spent most of his career at the University of Minnesota (1931-94), becoming an authority on stellar kinematics and discovering the majority of known white dwarfs. Luyten was famous for his many surveys of proper motions, which he used to derive the stellar luminosity function - this, in turn, allowed him accurately to map the stellar population of the solar neighbourhood. Luyten found that although only 0.5% of the Milky Way's naked-eye stars are less luminous than the Sun, 96% within 2250 l.y. are less luminous. We see these stars only because they are close, but basing a star census on this population would give a misleading notion of the Galaxy's overall stellar make-up. LUPUS (gen. lupi, abbr. lup) Small but not inconspicuous southern constellation, representing a wolf, between Centaurus and Scorpius. Its brightest star, a Lup, is mag. 2.3. 7 Lup is a very close binary with bluish-white components, mags. 3.5 and 3.6, separation 0".8; Ј Lup is another binary with bluish-white components, mags. 5.1 and 5.6, separation 10".4; and u Lup is a triple system consisting of bluish-white components, mags. 5.0 and 7.2, separation 23", the former with a bluish-white close companion, mag. 5.1, separation 1 ".1. 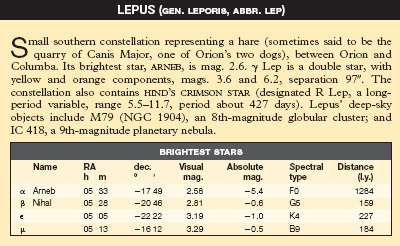 Lupus contains NGC 5822, an open cluster of more than 100 stars of mags. 9-12; and NGC 5986, a 9th-magnitude globular cluster. LYNX (gen. lyncis, abbr. lyn) Faint northern constellation, representing a lynx, between Ursa Major and Auriga. It was introduced by Hevelius in 1687, pointing out that one would have to be lynx-eyed to see it! Its brightest star, a Lyn, is visual mag. 3.14 (position RA 09h 21m, dec. +34° 24'; absolute mag. -1.0; spectral type M0; distance 222 l.y. ); 38 Lyn is a binary with bluish-white components, mags. 3.9 and 6.6, separation 2".7. Deep-sky objects include NGC 2419, a relatively bright (10th-magnitude) yet unusually remote (310,000 l.y.) globular cluster; and NGC 2683, a 10th-magnitude spiral galaxy. SKY SURVEY (POSS I). Despite the loss of an eye in a tennis accident, Luyten made his discoveries by eye, using a BLINK COMPARATOR device. Lyman-a forest Set of hundreds of redshifted ABSORPTION LINES that appear to the short-wave side of the Lyman-a EMISSION LINE in the spectra of high-redshift quasars. The quasar back-lights neutral hydrogen gas in the intergalactic medium. Each absorption line of the 'forest' is produced by a discrete filament of some sort that lies between Earth and the distant quasar, and thus has a different REDSHIFT caused by the expansion of the Universe. Absorptions of higher-order Lyman lines and similar systems for other elements are also seen. Lyman series Series of spectrum lines in the ultraviolet HYDROGEN SPECTRUM resulting from electron transitions down to or up from the lowest energy level (the ground state). The Lyman lines are named with Greek letters: Lyman a connects levels 1 and 2 at 121.6 nm; Lyman (3 connects levels 1 and 3 at 102.5 nm; Lyman 7 connects levels 1 and 4 at 97.2 nm; and so on. The series ends at the Lyman limit at 91.2 nm. Lyot, Bernard Ferdinand (1897-1952) French astrophysicist and instrument designer who worked at Meudon and Pic du Midi Observatories. He invented a coronagraph and a series of monochromatic filters (see LYOT FILTER) with transmissions as fine as 0.1 nm (1933-39). He also developed polarimeters to measure the polarization of light reflected by the surfaces of the Moon and planets, and used them to discover that Mars has dust storms and that the lunar surface is largely covered by volcanic basalts. Lyot was the first to use cinematography to capture the motions of solar prominences and to probe the structure of the chromosphere. Lyot filter Narrow waveband filter used for making observations of the Sun. The filter consists of alternating layers of polaroid sheets and quartz plates. The polarized light undergoes double refraction by the quartz plate and, when realigned by a further polaroid sheet, interference occurs, some wavelengths being cancelled and some reinforced. This results in a number of very narrow (0.1 nm) but widely spaced wavebands, which allows the desired wavelength to be easily isolated. It was devised by Bernard LYOTin 1933. Lyrids METEOR SHOWER active between April 19 and 25, with peak around April 21 or 22. The shower, the radiant of which lies 10° south-west of Vega, usually produces comparatively modest rates, with maximum zenithal hourly rate (ZHR) 10-15. Stronger displays have been seen on occasion, notably on 15 BC March 27 when 'stars fell like rain', and in 1803 and 1922. An outburst on 1982 April 21-22 produced rates of 75-80 Lyrids per hour. 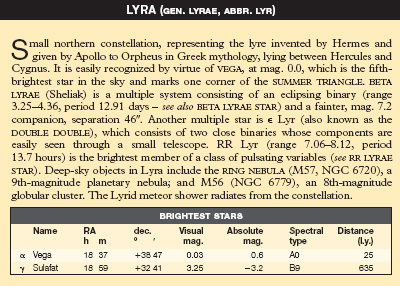 Lyrid meteors are quite fast (49 km/s or 30 mi/s), with a reasonable proportion of bright events. The shower is associated with the long-period Comet C/1861 G1 Thatcher.